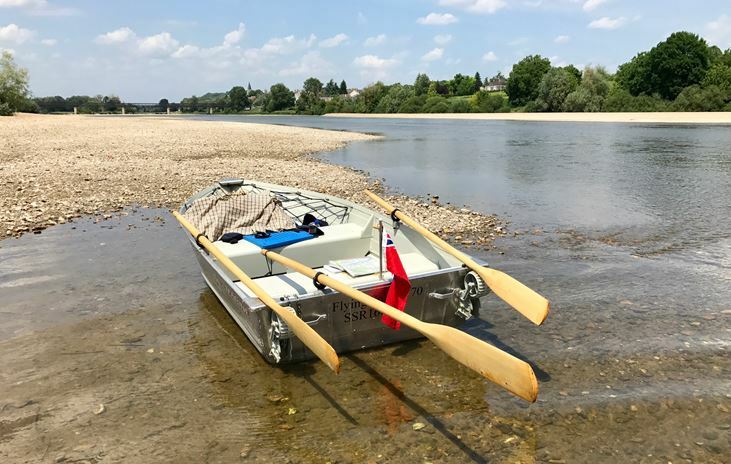 Member Martin Andrew recreated Hornblower’s escape down the Loire in a rowing boat. He and a friend were both introduced to CSF by their fathers in the 1950s and became what you might term lifelong fans. They decided it would be fun to take a rowing boat to Nevers and row the route. Martin is a published author (currently writing a book on an earlier voyage down the Severn) and intends to write up the Loire trip similarly. The boat, a 10 foot aluminium rowing boat, was registered with the Small Ships Register as “Flying Colours 70” (’70’ being their age). However, after four days they reached Gien and their boat was stolen overnight… In effect poetic justice for Hornblower’s theft of the rowing boat above Nevers that snowy night. Devoted member and enthusiast Serge Aillery has written about the Loire too. In the Summer 2016 edition of ‘La Loire et ses terroirs‘ he has crafted a fascinating vision of how the Loire entered C S Forester’s life with the honeymoon ‘Voyage of the Annie Marble’, and how its impression is pursued in three of the Hornblower novels. Serge expresses his love both for the Loire and for his favourite writer, in this thoughtful and impassioned article. Many thanks indeed, to Serge and to Martin for their contributions.